A friend recently emailed me about a book, saying I had to see a copy to believe it. He was right. I'm still a little stunned. But the discovery is pretty cool and should be shared. 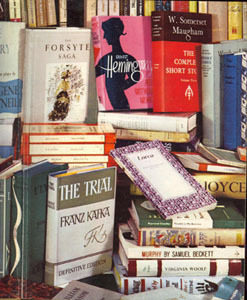 The book is The Concise Encyclopædia of Modern World Literature, edited by Geoffrey Grigson. Part of the surprise is that this highbrow encyclopedia has an entry on Tolkien--in fact it's a pretty sympathetic and understanding entry on Tolkien too. The other surprise is the publication date of the book. It came out in 1963, barely eight years after the third volume of The Lord of the Rings had been published--a few years before the pirated Ace Books paperback edition brought the book into notice in America and onto the bestseller lists. The endpapers to the book exhibit the tone of the encyclopedia nicely. There on the left side is a nice copy of The Return of the King in dust-wrapper, standing between Stephen Spender's Collected Poems and Carson McCuller's The Heart Is a Lonely Hunter. 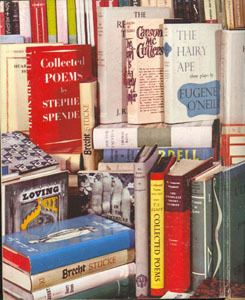 Nearby one sees books by Eugene O'Neill, Thomas Mann, Lawrence Durrell, T. S. Eliot, W. Somerset Maugham and D. H. Lawrence. On the right is visible various works by Ernest Hemingway, Henry James, James Joyce, Samuel Beckett, and Virginia Woolf, alongside continental writers like André Gide, Franz Kafka and Federico Garc�a Lorca. This is definitely Tolkien in good and proper company. The entries are all very knowledgeable, plus there are over one hundred and seventy five full-page plates of illustrations (usually but not always photographs) of writers. There are a number of good likenesses of writers I've rarely seen in photographs, like Jean Anouilh, Albert Camus, Jean Cocteau, William Empson, Robert Musil, Antoine de Saint-Exupéry, J. D. Salinger, Amos Tutuola, Nathanael West, and many others. Yes, there is a photograph of Tolkien--not one of the best, but worth reproducing. 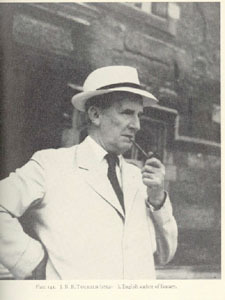 Tolkien, J[ohn] R[onald] R[euel] (1892- ), English writer of fantasies, is an author whose imagination is kindled by philology. Language has always been the chief love of and concern of this Oxford scholar of the early forms of English. He takes as much pleasure and shows as much skill in writing a poem in the language and metre of Caedmon as in writing a poem in the language of today-- witness a riddle written by him in an Old English that would have delighted King Alfred, even though he would not have guessed the meaning (since it is about a long-haired piano player, and Alfred knew only the harp). The first of his fantasies, The Hobbit (1937), contains incidentally a magnificent series of riddles in the great tradition of folk-riddling, as well as a riddle-game played for the highest stakes by the characters Bilbo and Gollum. Hobbit history has been in its creator's mind since he was a boy. Quite early he found himself wanting to invent a language, not just a few words of gabble, but a language with vocabulary, grammar, syntax, even poetry of its own. As he proceeded with the attempt, he came to see that a language cannot be invented in vacuo: you must know what kind of people they are who speak it. What is their history? What is their moral nature? What do they believe in? Who are their neighbours? And, if it comes to that, what languages do their neighbours speak? So he had (in this century of the Finnegans Wake of James Joyce, q.v.) to invent a world of people and languages. As tall as trolls they were, twelve feet or more in height; their strong bodies, stout a young trees, seemed to be clad with raiment of with hide of close-fitting grey and brown. Their limbs were long, and their hands had many fingers; their hair was stiff, and their beards grey-green as moss. They gazed out with solemn eyes. There are many others, too, on the Middle-Earth [sic], the Rohirrim, admirable horseman, the horrifying Balrog, and the abominable, unutterable Orcs, who are the slaves of Sauron--who is Lord of the Black Riders; and would also be Lord of the Rings. It is the history of an Evil Power that attempts to become a supreme power, the history of a grand struggle between good and evil, in which the responsibility of saving the sum of things falls on the most trivial, the laziest, the least ambitious, the smallest of two-legged rational beings, the Hobbit. It is a Hobbit, or rather two Hobbits, Frodo and his faithful servant Sam, who shoulder this responsibility and set out, against all hope, into the heart of the enemy country, on their terrible quest. For this is an epic story--that is, the story of a struggle in which the heroic virtues are quietly shown; it is a reaffirmation of courage, purpose, loyalty; epic values among many dangers and despairs, failures and feats. In all this we move through a vivid continent, which we seem to take in as we sweep through its changing features in the swift movement of the story: and we meet with name after name of places and people, all based on Tolkien's philological learning, all with their learned explanations for those who are also philologists, all for the rest of us names of an effective music--Anorien, Ithilien, Gorgoroth, Gandalf, Lothlorien, Barad-Dûr, Nurn, Mordor. We meet even a poem in the language of the Elves. It must be said that this history of Middle-Earth [sic] in the Great Year of its Third Age (for the author insists that his book is a history, not an allegory) is not everybody's book. In fact it divides humanity rather sharply: there are men of taste and intelligence who abhor fantasy--true fantasy (not whimsy) such as is to be seen in The Lord of the Rings. There are others, who feel deeply stirred and delighted by it, as by any other world of romance and tension. Like it or not, The Lord of the Rings is a new classic added to our language. The conclusions drawn by the writer of this entry are as true today as they were forty years ago. The Lord of the Rings is a new classic, heralded by many as the Book of the Century. And the remark about dividing humanity, about there being people of taste and intelligence who abhor fantasy, who simply don't get it, remains true today. When I first read this entry I was immediately curious as to who could have written it. None of the entries themselves are signed. I flipped through the encyclopedia and found a list of contributors--fifty names, all but one apparently men, unless another woman or two is hiding behind initials (evidently in 1963 men were nearly exclusively fit to judge literature, though a small number of women were conceded to have written it. Of the one hundred and seventy-six portraits, only ten are of women writers.). Of the fifty names, there is only one likely candidate for being the author of the Tolkien entry. One only who knew Tolkien well enough to have known the philological origin of Tolkien's mythology, and to have known that Tolkien wrote riddles in Anglo-Saxon. One who was also an Inkling, and who probably had heard Tolkien read aloud parts of The Lord of the Rings as it was being written. That person was Nevill Coghill. I salute him for so championing his friend's work in this reference work.